Pundits use them to create the impression that there are two rival factions in our political culture, presumably conservative on one side and liberal on the other. They say that conservatives are the right and progressives are the left. Thus, the reasoning goes, that far right, or alt-right means extremely conservative. Likewise, far left or alt-left means ultra-liberal. The worst of both bunches are crazy right and left–and violent to boot. So, they say, the playing field in Charlottesville contained two different extremes. Alt-right groups obtained a permit to protest the removal of a Confederate statue. Alt-left groups showed up to resist them. According to many reports, both sides carried weapons. Fortunately, they weren’t used. And, unwisely, the police stood down. Then we are told that an alt-right guy drove the vehicle that killed and maimed people. Thus, the mainstream media narrative proclaimed three not-so-subtle messages: 1) The “conservatives” are the bad guys, 2) They’re taking over the United States, and 3) Donald Trump is one of them. Almost all violent groups in America come from the progressive/secular side of the tracks. Nazis, Socialists, Communists, anarchists etc. hold one thing in common–their humanist/atheist orientation. They may have different causes. But they share the same morals and motivations. Without godly character and ambitions, they all are willing to use violence to gain power. 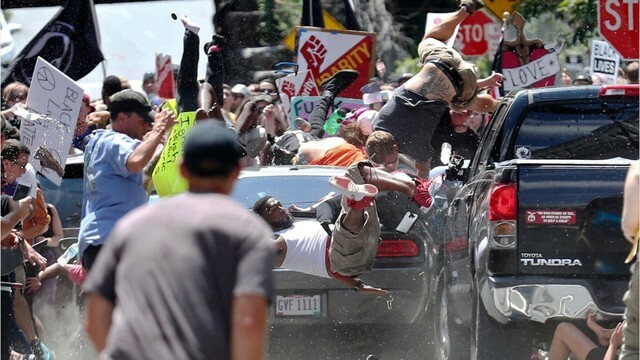 If “Conservative Right” and “Liberal Left” were honest opposites, then alt-right would be Martin Luther King Jr. and alt-left would be Alex James Fields–the domestic automobile terrorist in Charlottesville. Right and left do not work as explanations. The better perspective is good (non-violent behavior) versus sin or evil. Let’s get rid of the turn signal analogy. It’s a false comparison. The same is true of the racism charge. Yes, racism is sinful and evil–but only when it’s acted upon and hurts others. Thoughts are not crimes. They will be judged by God alone one day (1 Corinthians 4:5). This is why “hate crimes” is a very dangerous and mis-leading term. Hate in your mind or words is not a crime. But hurting or killing another person is. Evil acts. It commits crimes (sins) that hurt someone else. Human governments are commanded to punish and restrain those sins ( e.g. Romans 13:1-7). The main reason for “hate crimes” is to one day use it to lock up those who don’t agree with the dictatorship (such as Christians in a communist society). I agree that President Trump, in his initial remarks, should have more specifically blamed pro-Nazi, white supremacist groups for the carnage in Virginia. It was a lunatic Nazi-sympathizer named James Alex Fields that cruelly used his car to kill Heather Heyer and hurt many others. He earns the title of a domestic terrorist. But what he did was sin–the pure evil of taking human innocent life. So racism was the backdrop, and left and right served as a confusing smokescreen. But murder and assault were the crimes (evil). Former Arkansas Governor Mike Huckabee gave the best analogy of why racist crimes are on the rise. We need more free speech, strong punishment of sin, and repudiation of identity politics. Let’s not blame identity politics for our problems. Let’s not form a false dichotomy between right and left. Let’s not tolerate violence in any form (in the spirit of MLK). Let’s blame and punish sin (evil). Repenting of those sins is a first step toward American renewal. Please contact me personally so we can have an honest chat. I appreciate your burden and perspective. Just don't like dealing with ghosts. Throwing some shade on my anonymity? I choose to remain anonymous on the internet for safety reasons having nothing to do with courage or lack thereof. My words can speak for themselves. Knowing how you have a habit of painting with broad brush strokes, you may be more thoughtful without the crutch of knowing exactly who I am. Demonic forces in the guise of DJT are playing Christians like a fiddle. Why haven't you placed DJT within your “Demonic Triad”? Christian “leaders” like you who won't call out DJT unequivocally may want the benefits of a “Godly cabinet”, while DJT is free to pillage the soul of our nation. When in Christianity does the end ever justify the means? DJT is giving Christians just enough crumbs to keep them defending and polling for him at any cost. Skirting around the evil of DJT confuses vulnerable readers. You try to make points about racism being an excuse for sin, but you can't seem to take a very firm stand against the sin in a man some call our president. This weekend Mitt Romney and Arnold Schwarzenegger are much stronger, clearer moral voices on DJT than you. If you had never before gotten political, no problem; but since you have often been political, you can't just mumble along as if DJT is some minor inconvenience. You've taken stands on many lesser evils. Praying for a veil to be lifted? Why not pray for your own veil to lift so you are not so blinded by the evil residing in the White House. I am sorry about the death in your family. Please consider posting late if you don't have time to give it justice. Would have appreciate you having the courage to tell me who you are. Actually, my father-in-law passed away yesterday morning and we had the privilege of caring for him at his home for the past week. So, I've been a little removed from the news. I have never defended Donald Trump's foolish and garish tweets or actions. I'm just deeply concerned with the "Demonic Triad of Forces" that are hysterically trying to destroy America. If you can't see that in what is happening under the false guise of Left and Right and the true straw man of racism, , then I simply will pray for you for the veil to be removed from your eyes and that God bring you into the battle for the heart and soul of this nation–and our civilization as a whole. 1. The white supremacists are the bad guys. DJT's recognition of this was delayed, then later reversed. 2. White supremacists were not discouraged by DJT's very scripted tele-prompted remarks on Monday. 3. DJT let out his true feelings during his unscripted Tuesday Trump Tower presser. He appeared to defend the white supremacists when he said some of them were good people. His unscripted speech did not tell a lie. Your article is full of straw men. Your right/left expounding may be a smoke screen covering your own very strong reluctance to call out the serious lack of moral leadership in a man some call our president. Did DJT show or not show moral leadership by saying some white supremacists are good people? You may have posted this before DJT's Tuesday press conference. If so, maybe you should revise your remarks to reflect that. By now you must know DJT said there were “good people” among the white supremacists. Preach it, lack of moral leadership!